Interdisciplinary visual artist Lou Sheppard of Halifax, Nova Scotia has been selected to conduct the second annual Emerging Atlantic Canada Artist Residency in Banff. Lou Sheppard graduated from the Nova Scotia College of Art and Design in 2006, then Mount Saint Vincent University's Bachelor of Education as an art teacher in 2013. 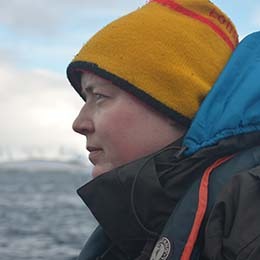 Sheppard's work -- painting, performance, video and audio installation -- has been exhibited both in Canada and internationally, and will be included in the upcoming 2017 Antarctic Biennale. Through shape, rhythm, and abstraction Sheppard's work explores identity, faith, and wilderness, and the intersections between them. Sheppard lives in Halifax dividing time between teaching and working in studio. During the residency, Sheppard will create a new work called Requiem for the Polar Regions for the upcoming Antarctic Biennale. Requiem for the Polar Regions is an aural exploration of the shifting ice masses of the Arctic and Antarctic regions. The project tracks daily changes in ice by analyzing available satellite imagery and then translates this data into musical notation. The resulting musical scores are then playable on the internet and made available for live performance.